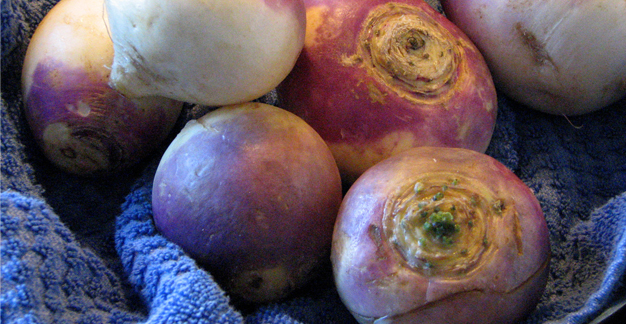 Both the turnip and rutabaga probably originate from Sweden. They are similar in flavor. Both cooked and raw turnips have several uses. 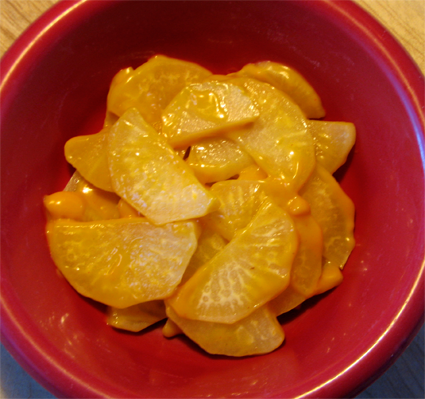 They can be cut up and added to salads, sliced and served with avocado or dip, added to soup for a light and sharp flavor (either in small pieces or shredded), stir fried, or cooked as a hot vegetable by themselves or with carrots. Turnip greens are a very healthy side dish when steamed with onions. Select firm, fresh turnips without rust or shriveling. Store turnips in a plastic bags in the refrigerator and they'll keep for two weeks. 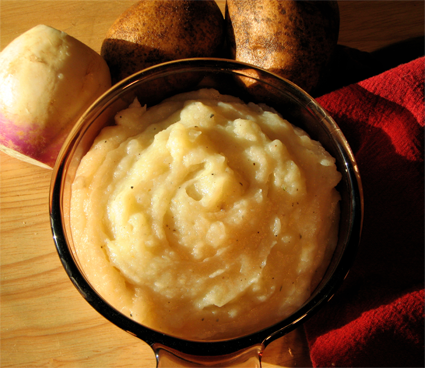 Peel and cut the turnips and potatoes into roughly equal sized small pieces. Steam or boil for 10 to 15 minutes. Mash the cooked vegetables together along with the rest of the ingredients. This can be made ahead and reheated in the oven or microwave. 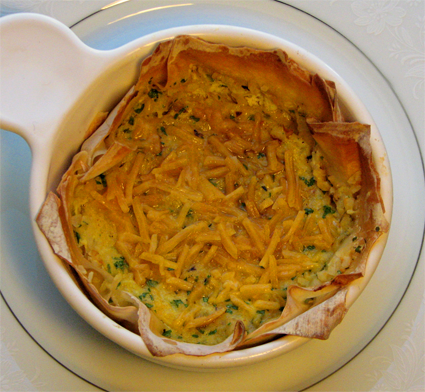 It can also be used as a topping for shepard's pie. Serves 6 to 8. In a large fry pan, over medium high heat melt butter. Add the turnips, onion and green pepper. Cook for five minutes until the onions and turnips have begun to get tender. Allow to cool slightly. Beat eggs together with the milk, seasonings, and parsley. Grease four oven proof bowls. Line each with two overlapping egg roll wrappers. Be sure to overlap the corners over the bowl to keep the sides from slipping down. Combine the turnip mixture with the eggs and milk. Divide the filling evenly between the four bowls. Bake in 350 oven for 45 minutes. Add the shredded cheese and bake 10 minutes more. Serves four. Either steam or boil turnips for 8 to 10 minutes. Meanwhile melt butter in a medium sauce pan over medium high heat. Add the flour and stir to combine. Cook one minute. Add milk or cream, stirring continuously until thickened. Turn down heat to low. Add cheese and stir until melted. Remove pan from heat. When the turnips are tender,place them in a bowl and add cheese sauce. Serves six. To prepare fresh bread crumbs remove the crust from two slices of whole wheat bread and tear or cut into tiny pieces. Reserve 1/2 cup for topping. Combine 1/2 cup of crumbs with the turnips, 2 Tbsp of oil or melted butter, salt, pepper, egg, and Tabasco sauce. Beat with an electric mixer to combine completely. Place into two well greased oven proof bowls. At this point, the containers can be covered and refrigerated until later, if desired. Bake in a 350 oven for 45 minutes. Meanwhile combine the remaining breadcrumbs with the remaining oil or melted butter, and the cheese. 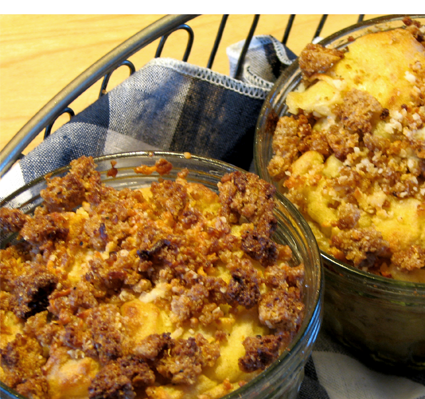 Place the breadcrumbs on top of the mashed turnips and bake for 10 minutes more. Makes two servings. This can be doubled.